Fold his eggs. Watch Finding Bigfoot with him. Write love notes and send sweet texts. These are ways to respect your husband. 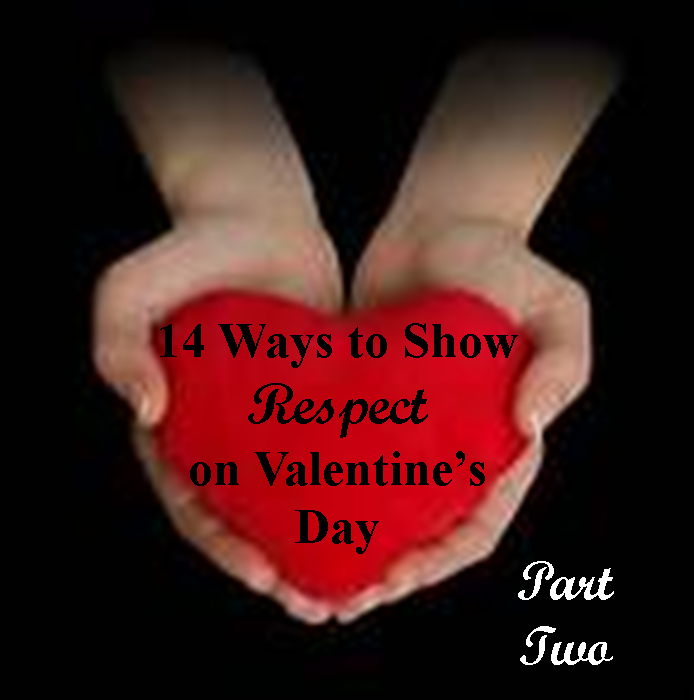 Click here to read Part One on 14 Ways to Show Your Husband Respect on Valentine’s Day. Encourage the children to show honor to their father every day. The first commandment with promise is “Honour thy father and thy mother, as the LORD thy God hath commanded thee; that thy days may be prolonged, and that it may go well with thee, in the land which the LORD thy God giveth thee,” Deuteronomy 5:16. One of the best things you can do for your husband is to teach his children to honor him in attitude and action. Teaching this also greatly impacts your children. If we don’t teach them to honor their earthly father, they will have a hard time learning how to honor their Heavenly Father. A lack of proper respect and obedience for those in authority will transcend into a lack of proper respect and obedience for the Highest Authority – God Almighty. The strongest man who ever lived was nagged so much, “that his soul was vexed unto death,” Judges 16:16. Don’t be a nagging wife. It is very disrespectful and is more annoying than a leaky roof. “A continual dropping in a very rainy day and a contentious woman are alike,” Proverbs 27:15. Besides that, you will never change his heart or ways through nagging. Love him and win him over with a “meek and quiet spirit”, 1 Peter 3:4. Have you ever seen a smiling face that was not beautiful? Smile at your husband and do it often. It will bless his heart. “A merry heart maketh a cheerful countenance,” Proverbs 15:13. Your husband carries a large load. He is responsible for his family physically and spiritually. He needs your prayers. It will strengthen your marriage and your love and respect for him. “Praying always with all prayer and supplication in the Spirit, and watching thereunto with all perseverance and supplication for all saints;” Ephesians 6:18. One of my dearest friends gave my some advice years ago that has transformed my marriage. She said, “Take an afternoon nap so that when your husband comes home you will have energy left for him.” You know how tired and exhausted you are at the end of the day. And it is quite easy to use up all of your energy before he comes home, so save some energy for him. If that means taking a nap – DO IT! He doesn’t want your leftovers. Respect him enough to take care of your body. Trust me on this one! Dress in a way that pleases him. I have a white jacket that my husband hates. I like it, but for some reason it reminds him of the 80’s. The other day I put it on over a dress and when I asked how I looked he responded with “okay”. Because he is always kind and gracious with his compliments, I know that “okay” is code for “not so good.” So, I took it off. Thinking back even now, I am sure that all my friends would agree that the jacket looked great. But is that really the point? My husband doesn’t like it. I think I will go right now and put it in box marked Give-Away. Make building a godly marriage a priority. Your marriage is the most important earthly thing you can build. Make it lasting. Make it strong. Be a testimony to this lost world. It will take work no doubt, so be willing to work hard at building a godly marriage. “Whoso findeth a wife findeth a good thing, and obtaineth favour of the LORD,” Proverbs 18:22. For more on building a godly marriage click here.